Produce professional color in-house, on demand. With 512 MB of upgradable memory, a fast dual-core processor, and standard Gigabit Ethernet networking, the Lexmark CX410de offers the speed as well as power and convenience of printing wherever or whenever you need to. Quickly print up to 32 pages per minute in black and color, plus produce a one-page color document in as little as 11.5 seconds. Easily print up to 6,000 pages a month, plus enjoy fewer maintenance hassles, thanks to state of-the-art paper handling. 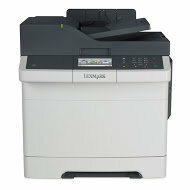 The Lexmark CX410de's 1,450-sheet input capacity cuts down on tray refills. 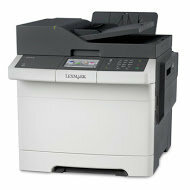 Stay on top of your jobs with Lexmark's convenient 4.3-inch color touch screen and front direct USB port. Now you can authenticate, authorize and audit employee usage. Plus, protect sensitive data using standard network security protocols. 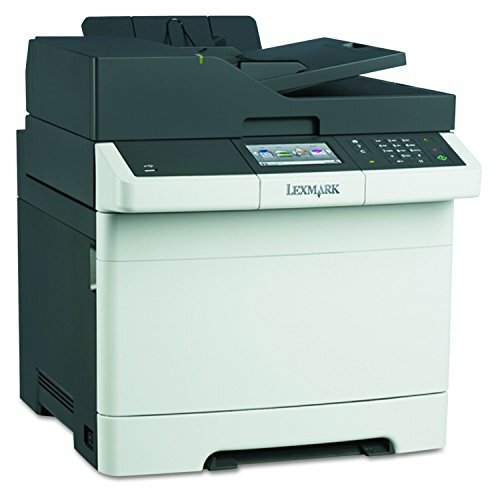 The network-ready Lexmark CX410de MFP with a 4.3 inch color touch screen and a print speed as fast as 32 ppm with 2-sided printing lets you copy, scan and fax. With 512 MB of upgradable memory, a fast dual-core processor, and standard Gigabit Ethernet networking, the Lexmark CX410de offers the speed as well as power and convenience of printing wherever or whenever you need to. Enjoy Enterprise-level Security: You can authenticate, authorize and audit employee usage. Plus, protect sensitive data using standard network security protocols.